Andrea | I have to write something EVERYDAY?! Monday-Because we didn’t have school on Friday, we spent Monday making up all our end-of-week tests. Wednesday-Because we didn’t have school on Tuesday, we spent Wednesday making up everything we were supposed to do on Monday but couldn’t because of the Ice Day. Thursday-I tried to figure out how to salvage the week. Friday- I realized that this week couldn’t be salvaged. During all this we began our most-dreaded math unit of the year: coins. At the beginning, I tell the munchkins that they must pay very close attention and do exactly what I say. They don’t believe me. They think it’s so easy to identify nickels vs. pennies (Day 1). “Why do we have to write the values above the coins as we count them? This is baby stuff!” Then, when students have to count groups of half-dollars, quarters, dimes, nickels, and pennies (Day 5), it all makes sense. The students did what I asked even though it was “easy peasy mac and cheesy/lemon squeezy” are still doing great. The past two years, I had the group of students who followed my directions and did well, and the group that didn’t follow directions and struggled. This year, I made them all follow my directions. I would count every problem wrong if it didn’t have the values of the coins written above, even if they counted correctly and got the right sum. Ruling with an iron-fist can be beneficial. We had another abbreviated week, so I’m combining posts again. Week 16 can be summed up in five words: six tests in three days. We had to finish all our units before the winter break. Well, we didn’t have to, but I thought it would be cruel to make the munchkins work over the break, so I felt we had to. But, all the tests had to be near the end of the week so that we didn’t have time to start anything new. At first the munchkins were suspicious about all those tests. But, when I explained that this meant the last week of school would just be fun and they wouldn’t have any homework over the break, they got on board quickly. Unfortunately, a plague went through my class and we had numerous kids out on each of the test days (6 kids on Wednesday!) and so week 17 became known as…. …the week of make-up tests. We had three half-days to make up the tests. Some kids had missed all six! I had to pull munchkins away from their fun activities and make them take a test on Earth science, or number patterns, or compare and contrast. It was unpleasant. But, when we weren’t doing make-up tests, we were having wintery fun! 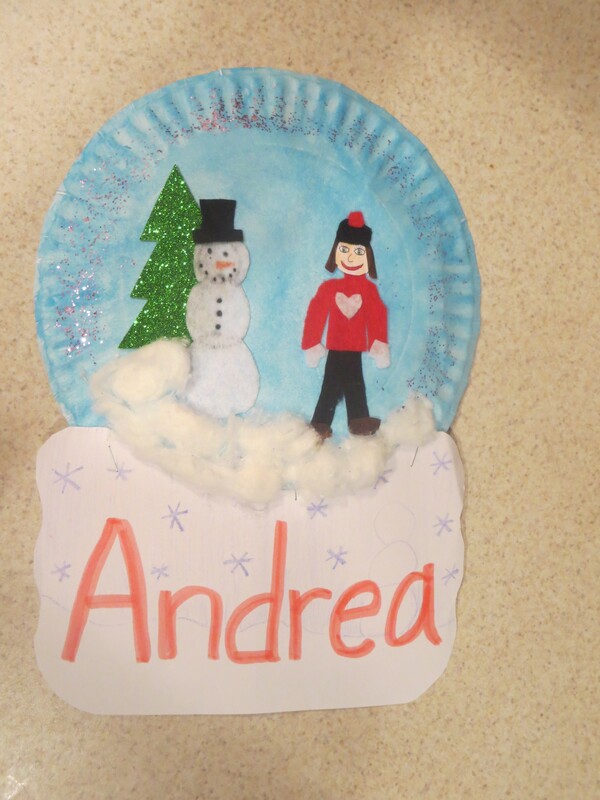 Students wrote winter stories on mitten patterns and we made snow globes out of paper plates and felt. I made this as a model so the munchkins could have an idea of what the finished product should look like. It got a little bent on the way home. My buddy teacher and I found the idea on Pinterest (where else!) last week and thought it would be perfect. The thing we didn’t anticipate was how hard it would be for the kiddos to cut out clothes from the felt. We should have cut out the clothes for them, or at least made many stencils ahead of time. But did we think of that? No. So we were forced to cut little stencils out of notecards as students wailed about their shirt not looking right. But in the end, all the snow globes looked cute and the kids were able to take them home. Week 14 was a non-week since it was Thanksgiving break. We didn’t do anything normally. It wasn’t worth a post. This week, it had the appearance of normalcy because it was a five-day week. But, there were many interruptions. Monday-Normal- We learned about author’s purpose in ELA, counted with number patterns in math, and began learning about soil in science class. Tuesday-Not Normal-Tuesday morning was Doughnuts with Daddy. Each class put on a small presentation for the dads–we sang a song about daddy and baby bears to the tune of “Hush Little Baby”– and then enjoyed eating doughnuts and playing on the playground with the dads. I don’t know if you can remember back to when you were six, and imagine what it would feel like having your dad take off work, come to school, just to give you attention. I know I can because my dad came to have lunch with me once when I was in first grade and I was bursting at the seams the whole morning. That was basically what happened to 130 children on Tuesday. Wednesday-Normal-We wrote thank-you cards to our dads in ELA, learned about counting on a hundreds chart in math, and practiced writing our address in social studies. Thursday-Not Normal-I had a doctor’s appointment at 10 right by my house, so I thought I would just take the morning off. I gave very clear, detailed sub plans and planned lots of fun things for my kids to do. When I got to school, I knew what would happen. Chaos would erupt. And it did. It’s like they hadn’t seen me in a month. “I missed you so much!” “School wasn’t good!” “Can I kiss you? !” All this while I was trying to be discreet since the kids were in one of their special area classes. So I just hissed “I missed you too! I’m sure it was good! No!” It would have been an exercise in futility to assume that the rest of the day would precede normally. But, we got through the afternoon. Friday-Not Normal-There was a little ice on the road, so we had a delayed start to the day. Usually, this would have triggered a crazy day that was less than productive. But, after all the other interruptions during the week, this was just too much for the munchkins. I think their little brains broke. They walked into class and stared at me. I said, “Let’s work” and they said “okay.” So it was an awesome day.